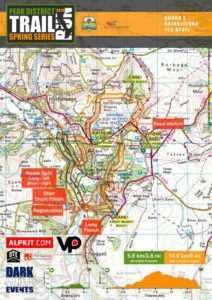 Dark & White Trail Running Events are all based in and around the Peak District National Park, most events having a choice of a long or short course. The Grindleford run was the second of this years ‘Spring series’. The long course was 14.5km and the short course was 5.8km. The weather was pretty good and the course was as always, well sign-posted and marshalled. The long course was a varied route, starting with an easy flat run beside the river Derwent. It was then on to Rough Wood then Oxhay Wood climbing steadily to Surprise View. A mix of woodland and moorland, towards Burbage then through the Longshaw Estate following the river at Padley Gorge. The final bit was through woodland then finishing back in Grindleford. A bit rocky and boggy in places (there were reports of several lost shoes!) but a fantastic route which I would love to run again! I would definitely recommend ‘Dark and White Events’ trail races. They are reasonably priced, well organised and always finish with great tea and cakes – happy days! The final race of the Spring Series is in Tideswell on 28th April. Unfortunately Alison Forward didn’t finish the course – we are not sure what happened but we hope you are OK.
Well done Chris, Fran and Jennie!